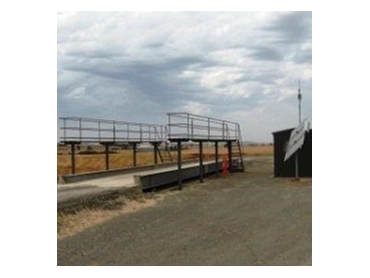 Accuweigh’s Adelaide branch recently installed a solar powered weighbridge into a remote area of a farm that doesn’t have access to mains power. The farm weighbridge is used for weighing truckloads of hay coming in and going out from the storage sheds for Marrabel Hay in SA. The solar panel easily provide enough power to operate the weighbridge electronics, including the digital weight indicator, six weighbridge load cells and an attached printer which is used to print tickets for all truck movements. Batteries are used to store the excess current from the solar panels for later use during extended cloudy/rainy periods. The weighbridge is 18 metre long and 3 metres wide and using six weighbridge load cells and has inspection platforms fitted to both sides of the weighbridge to allow for inspection and sampling of hay quality. A Rinstrum digital weight indicator displays the weighbridge weight readings and also sends weight data to a printer for recording and to a PC for invoicing/accounting use. Accuweigh is an Australian industrial weighing company and has branches in all mainland states offering local state based service support to national clients.